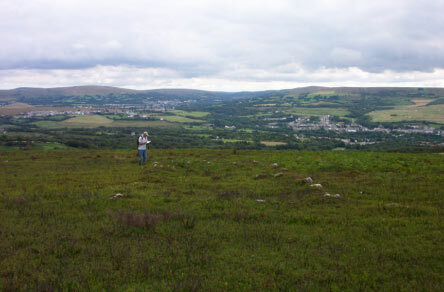 In modern times, the Welsh uplands have been seen as a remote wilderness, but recent work by Dyfed Archaeological Trust has shown that this was not so until relatively recently. 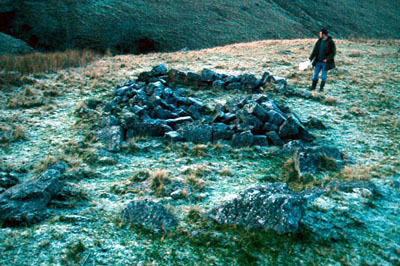 In a series of projects commissioned by Cadw to study Deserted Rural Settlements, Dyfed Archaeological Trust have reconsidered the evidence for settlement in the uplands of south-west Wales, from Preseli to Pumlumon and across to the Black Mountain. Between 1996 and 1999, over 600 sites were visited and detailed historical research was undertaken in an attempt to better understand these settlements. Traditionally, the ruinous settlements of the uplands - often called 'long huts' - have been interpreted as being mediaeval 'hafods.' But we now know that many date to the post-mediaeval period, representing the homes of shepherds, metal-miners and peat-cutters and their families. Through studying the archaeology and history of these settlements, an important, but unwritten chapter in the history of Wales is being filled. The fourth year of Deserted Rural Settlements field survey (1999-2000) focused primarily on evidence for deserted settlement in selected lowland areas and addressed issues relating to sites which are representative of the homes of those at the lower end of the social scale during post-mediaeval times, especially the cottages of the agricultural labourers who formed the rural majority. The project focused on the parishes of Llansadwrn in Carmarthenshire, Troedyraur and Llangynllo in Ceredigion and Eglwyswrw in Pembrokeshire. A condition survey of recorded Deserted Rural Settlement sites was also undertaken within the area of the Pembrokeshire Coast National Park, visiting nearly 150 Deserted Rural Settlement sites. Project findings suggest that within lowland communities in southwest Wales there are significant numbers of Deserted Rural Settlement sites which have early- or pre-19th century origins. In the parishes examined during 1999-2000, a significant number of settlement sites were recorded which had been abandoned during the decades between 1800 and 2000. Deserted Rural Settlements Project - Location of Study Areas These figures are based on relatively rapid observation of cartographic sources and aerial photographs and are not likely to represent the full extent of the Deserted Settlement archaeological resource for any of the parishes named. However, they indicate that there does appear to be a significant post-mediaeval archaeological resource in rural communities which has hitherto been poorly identified. 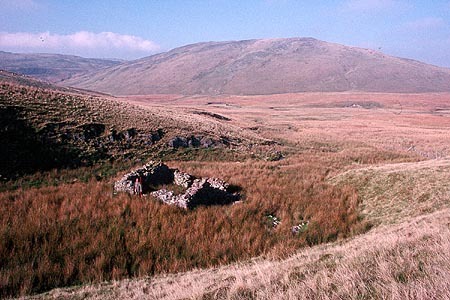 It is clear that Deserted Rural Settlements must be recognised as an important archaeological monument type characteristic of lowland, as well as upland landscapes. The project has also shown that Deserted Rural Settlements in lowland areas are a threatened and decreasing monument type. It is evident that half of the known settlement sites included in the 1999-2000 survey now have no surface remains. The need for a selection of the best surviving examples of lowland Deserted Rural Settlements to be brought into statutory protection or other appropriate management schemes has therefore been highlighted by the project. The survey also indicates that the continued study and evaluation of Deserted Rural Settlements offers opportunities to link the archaeology of settlement to the social, cultural and economic history of the community. Lowland Deserted Rural Settlements, even in intensively farmed landscapes, are important symbols of past communities and their increasing scarcity increases their collective and individual value. The study of the homes of the werin bobl or the common people undoubtedly needs to be addressed from an archaeological perspective in order to unravel the complexities of settlement history in rural communities. This project takes a positive step in that direction, in what is a dynamic and rewarding field of research which can have major implications for our perception of the built and archaeological heritage of our nation. The results of the project are being incorporated into an academic and a popular publication . Of these four specific site-types, 417 sites had already been visited as part of the Deserted Rural Settlements Project between 1996 and 2001. A further 109 sites have been visited by Trust staff in recent years during the course of other survey work. It is felt that sufficient in-house knowledge and information exists on these sites to make another field visit unnecessary. The records for this group of 109 sites can be rapidly enhanced to conform with the DRS project standards as a desk-based exercise. Following the desk-based exercise it was proposed that visits should be made to the remaining 559 sites in order to complete the review of DRS areas in southwest Wales. It was proposed to extend this survey over a period of 2 years. These visits will ensure that accurate information is available regarding their characteristics and landscape context and to assess the nature of any likely threats. The review of the records for DRS sites in 2001/2002 identified 559 sites that required further assessment. A two-year programme to examine these sites was begun in 2002/2003. A total of 348 sites were identified for assessment during this first year comprising further desk-based work on the 109 sites not requiring a site visit and field visits to 239 sites in Ceredigion and North Pembrokeshire. Amendments made to the HER database structure as a result of the 2001-2002 assessment project meant that these visits were able to record accurate information regarding the characteristics and landscape context of the sites visited, as well as assess threats and make scheduling recommendations where appropriate. 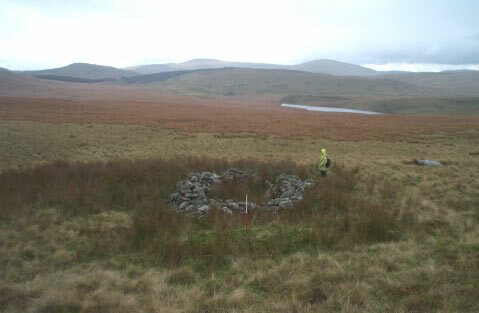 A long hut on the open moorland of the Pumlumon massif with Pumlumon and Nantymoch reservoir in the distance. 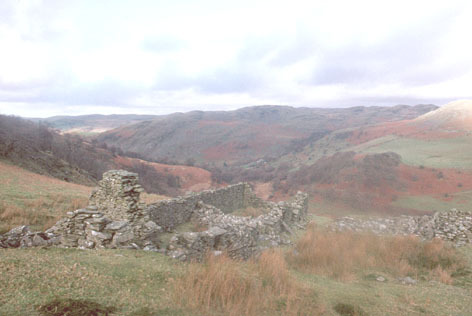 Such remote settlement sites on the open common may be medieval hafotai as their location is markedly different to those of the post-medieval lluestau of the regin, which are usually found in sheltered valley locations. It was not possible to assess 64 of the 348 sites examined during the year, either because of inaccessibility or failure to locate the sites. A further 45 sites that were assessed were discounted as DRS sites. This left 239 sites that were successfully reassessed through site visit or desk-based analysis. The enhancement of the HER record for these sites included the gathering of information regarding the landscape context, condition and potential threats, in the hope that more informed comment could be made about their purpose and also assist is their future management. A full consideration of the distribution patterns for these sites must await the completion of the project. 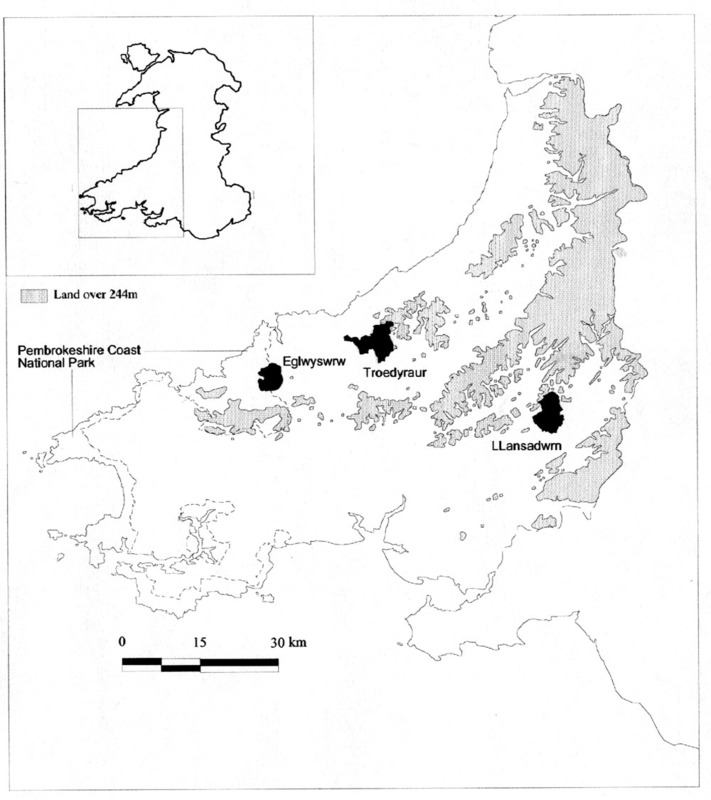 However, the apparent concentration of known sites in upland areas, along the coastal edge and also in the Castlemartin area of south Pembrokeshire is partly indicative of the focus of specific fieldwork projects undertaken over the last 25 years. Work is ongoing on the field assessment of the remaining 316 sites in South Pembrokeshire and Carmarthenshire. These represent the last element of Dyfed Archaeological Trust’s DRS project. As of the end of September 2003 all the upland sites have been visited, representing approximately 70% of the project fieldwork. For most of these visited sites, the database enhancement and photographic archiving has also been completed. represent the archaeological remains of the medieval hafotai.